Leave it to Mayhem to shoot themselves in the face, however, and opener Vortex Void of Inhumanity is still an obvious failure nearly two decades later. Shockingly electronic and a clear break from the past with its industrial fuzz and spoken vocals, its only saving grace is how nihilistic and bleak it sounds – the EP would be better without it, but when you've gotten used to the EP opening like this, it sits in uneasy brotherhood with the harsh black metal that follows. And when I say harsh, I mean it; the clattering wall of noise that is I Am Thy Labyrinth is a rush of hatred given inhuman purpose by Maniac's beastlike yowl. Hellhammer's drums dominate, of course, but it's already clear that Blasphemer's guitar is something quite distinct and powerful, a textural blur that fills in the rotten flesh between the percussive bones. And when the vocals start shifting with the introduction of some monklike-chanting behind the yowls, the final piece of the atmospheric puzzle is in place, and the impact is undeniable. It only grows in power as the track continues through a breakdown and some vicious chugging, before returning more insanely grandiose than before. Fall of Seraphs is possibly even more powerful, thunderous and proud initially then growing in madness as Maniac's vocal changes become more pronounced, from enunciated speech to rasping squeals. The technicality of the music is more notable too, especially on the following Ancient Skin, which sees the newfound complexity of the band's music embraced. (Worth pointing out, of course, that De Mysteriis is far from structureless noise and was way ahead of its time; but Mayhem go beyond it here and increase the focus on the technical side, progressively in both small and capital P terms.) And finale Symbols of Bloodswords is a revelation, taking a weird step sideways as the stop-start structure positively writhes, focusing on atmosphere and proving the band didn't need Csihar to sound evil. 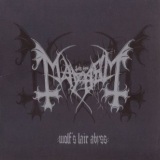 As a symbol of moving on, of opening a new chapter in the band's history, Wolf's Lair Abyss is undeniably a classic moment in Mayhem's history, and indeed of black metal history as a whole. 1997 was the year that the genre began to experiment with itself, after all, the emergence of the likes of Arcturus and Solefald into the limelight and the decline of the purity of the second wave of black metal. We all have our opinions over whether this was a good thing or not; what ultimately matters is that Wolf's Lair Abyss took the crisp evil of De Mysteriis and updated it slightly, proving that both Mayhem and black metal as a whole could move with the times without 'selling out' by signing to big labels or changing their sound to make it more palatable. (I still prefer De Mysteriis for the more complete sound and don't at all agree with those who think the EP is better, for what it's worth.) When all is said and done, Wolf's Lair Abyss is black metal just past its historical peak, and a vital part of the genre's history.